A couple of weeks ago, I wrote about the Phases of Data Intelligence. I just came across Benedict Evans' presentation at GE's Mind + Machines event. He had a more simple yet similar version of the same idea. I have seen a rash of "the rich are getting richer" stories in recent months, because, well, they are. But most articles I have consumed focus on tax policy and other mechanisms that have for the most part assisted in this shift of wealth over the last few decades. This one took a different tact, and it got me thinking about the impact of the concepts of network effects and compounding interest on inequality. This article focuses on the environmental effects of having wealth on a child's development. Interesting, but there is a larger ecosystem at play that further expands the gap between rich and poor: the network. I am fortunate in that I grew up in the US in an upper middle-class family. I did not have a ready-made network for me to access, but I had other assets that have allowed me to develop my own network much more rapidly and effectively than many. Principally, my network began because I had more flexibility as to how and when to earn an income. Paying for college was not a worry, and my living expenses were subsidized (thanks Mom & Dad!). affording me to take an unpaid internship at The White House while in college. This opportunity not only began my career, but also began the development of my network that continues to compound and pay dividends. I have reconnected with several folks I met during those early years over the last year, as I develop my latest business. 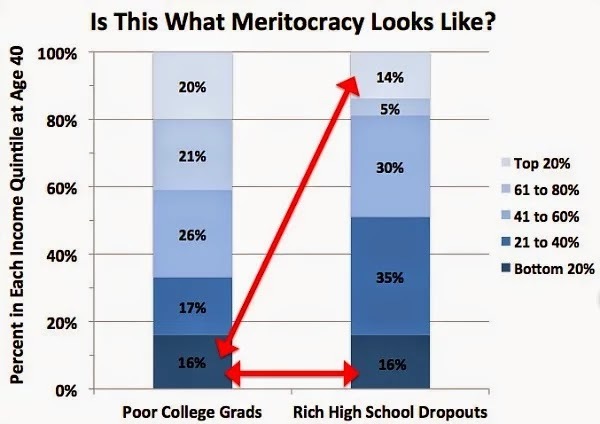 Providing opportunity is one component of a much larger ecosystem. Those in need also must have the means and flexibility to fully exploit opportunities. Policy, philanthropy and other initiatives that attempt to address inequality have to look at the entire ecosystem. Failing to do so may lead to exponentially less potent effects. I have been following the "internet of things" idea as it has emerged over the past few years. I own a Nest. I want a Sonos. Etc, etc., etc. But, I've always struggled at understanding the underlying value of such systems. I haven't seen real problems solved by these devices yet. I have no doubt that it will come, but the space is just too immature at this point. 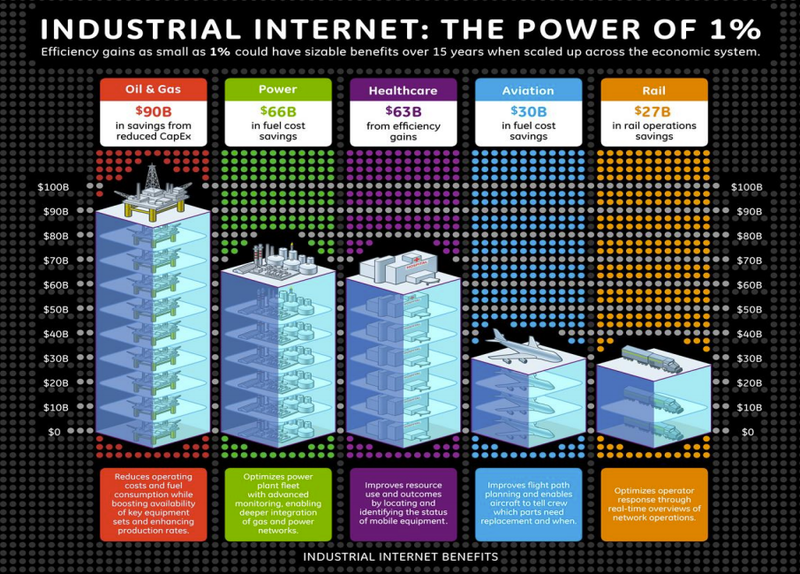 Enter the "industrial internet". I had the fortune of attending the Colorado Innovation Summit in Denver back in August. There, GE's Jeff Immelt spoke of their significant investment of what they call the industrial internet. Essentially, this is the enterprise version of internet of things, or industrial IoT. My "ah ha" moment was the realization that opportunities in industrial IoT can win simply with a clear ROI. And win they are - Mr. Immelt spoke of several examples already in play among their businesses where they are applying industrial IoT to deliver double-digit returns. The same is true on the consumer side, but the definition of return is so much more difficult given human behavior. And how that return is delivered on the consumer side can take so many forms. However, among key industries, incremental improvements in efficiency have significant impact on profitability, given the minimal cost of implementation of many industrial IoT concepts. These investments will have a huge impact on every industry and the global economy in the coming years. "Big Data" has been a thing for a few years now. As with any new idea, the hype and promise of what it is can overshadow the effort required to actually deliver. Big data is no exception. Many focus on the promise of "predictive" intelligence without understanding the effort of basic data collection. Others focus on dashboards and other tools without building the infrastructure needed to deliver those pretty pictures. Stage 1*: Data Collection - many systems, processes, tools already through off a ton of data. For most industries and applications, this data is often not stored, let alone organized for use. Stage 2: Data Infrastructure - for storage and organization, quality infrastructure is required. This is where much of the foundational innovation has happened in the last 10 years or so, that has spurred idea of big data. The idea of it being too costly or too difficult to store and organize vast amounts of data is no longer true. Stage 3: Data Visualization and Interpretation - this is an area that some skip by either hubris or eagerness. Hubris is when those not in the trenches believe they know the right path to extract intelligence from data, and build accordingly. Eagerness manifests by going after predictive intelligence before knowing what data and information is available. Stage 4: Data Intelligence - this is the stage where real value is delivered. The steps above are the plumbing to get you to this point of actually learning from the information gleaned from data. This is the stage where action is taken, given what is learned. Predictive intelligence is an extension of data intelligence, whereby historical data is used to preemptively make decisions in the future. As "cool" as it is to do, there is so much that can be learned and value uncovered by effectively developing intelligence from historical data.